This category houses all my posts about social media including tips for using Facebook, Twitter, Linkedin, Google Plus and doing it more efficiently. What if you had your own, personal Google search engine that searched the far corners of the Web for the very things that interested you, automatically and then delivered the results to you at regular intervals each day or even as the terms appeared? Does this sound awesome? Well, you can almost have all of that with Google Alerts. keeping tabs on your favorite sports teams. I am not a social media professional but I have come across some tools used by professionals that have worked well for me. The tools allow me to maintain consistency and a substantial presence in social media, without spending all day working on it. I can do things such as scheduling messages, tracking statistics and optimizing my messages so they go out at the time they are most likely to be seen. Let me tell you about the tools I use. I use HootSuite as my primary client to schedule posts to Twitter, Facebook and Linkedin and to track everything I am sending out. HootSuite is the default client for most social media professionals since it allows management of multiple accounts, scheduling of messages, tracking statistics and a lot more for $9.99 a month (there is a free account with basic features that might be worth a try to get started and a more sophisticated account for professionals). In HootSuite, you can add Twitter, Facebook (both normal accounts and pages), Linkedin, Foursquare and Google +. You can schedule tweets for just about anytime up to months in advance, while adding pictures and links. HootSuite is great for promoting a blog or other website. Here is a screenshot of the home page on my account. One way I use HootSuite is after I write a blog post and schedule it to post at some point in the future, I will schedule messages to go out following the time the blog post publishes. 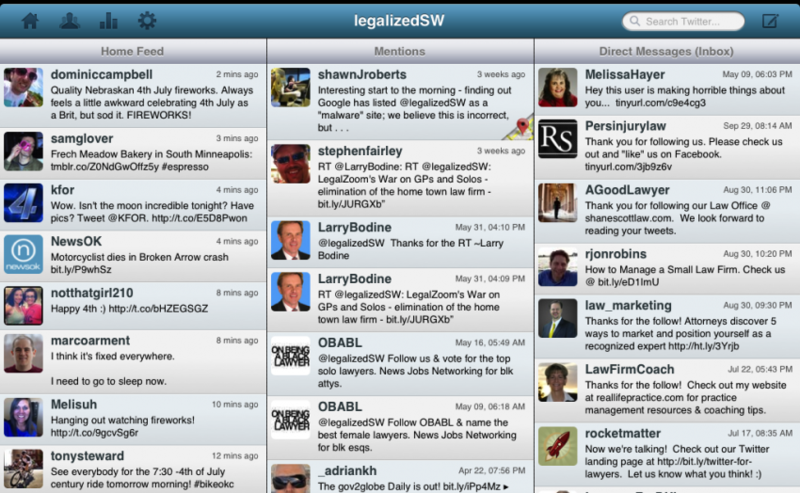 HootSuite has a web client, a great iPad app, a really good iPhone app and an Android app. Additionally, there are browser plugins for Hootsuite for Chrome, Firefox and something called a “Hootlet” for Safari and Internet Explorer. In addition to HootSuite, BufferApp has some of the same characteristics but a different principal: BufferApp schedules the things you want to post for you and spaces them out through the course of a day or week. You put material in either by typing up messages or adding material directly from a browser. BufferApp spaces the material out and sends it at times that you set. The pro version of the app is $9.99 and allows you to schedule specific messages. BufferApp lets you post to Twitter, Linkedin, Facebook and Google +. Here is a look at the home page on my BufferApp account. BufferApp has an iPhone App, as well as plugins for browsers including Chrome and Safari. With either HootSuite or BuffApp you can use Google Chrome extensions to post stuff directly from the web to your accounts. Here is a picture of the extensions. I think either of these apps would be good for scheduling messages and maintaining a consistent social media profile. I know there are other services that allow scheduling of messages, these are the two with which I am most familiar. A few years ago it ocurred to me that it would be good to work and be productive regardless of my physical location. That meant being able to be away from my office and still work at a high level, without having to explain to everyone with whom I deal that I am “away from office.” For real efficiency reasons, family reasons and particular quirks of my personality and temparment, working away from the office is critical for me. When I began considering my mobile strategy, the tools for doing this either existed or were quickly coming into existence. Today, I believe I have accomplished what I set out to do: I can work efficiently and effecitvely from just about any physical location. My analysis below assumes a person who is comfortable using email and browsing the Internet. 1. Laptop Computer. For me it is the 15″ Apple MacBook Pro (mid-2010 version). But you don’t need an Apple laptop, any solid and reasonable sized PC Lapton (Dell, HP etc. . . take your pick) will work fine. This computer is your work station in your mobile office. The machine needs to be able to most of what any desktop computer can do. 2. Smartphone. Since I usually don’t have access to a landline, having a working telephone connection is a must. There are many options. My phone of choice is the iPhone 4 through Verizon. The smartphone has to work for voice calls (which are still at times a necessity). It also needs to provide quick and easy access to email, texts and any other regular forms of communication you use. Often, when I am working on the MacBook Pro, the phone is notifier when I have a new email or other message. I can also send quick replies to multiple messages easily, using the iPhone. 3. Mobile Internet Device. Free WiFi is ubiquitous but I still find it problematic. Coffee shops, restaurants, libraries and even the local automative parts store offer free WiFi. How secure is a free network that doesn’t require a password (not very)? Is the free WiFi fast enough to get anything done? Do you have the free WiFi everywhere you need it? For all of these reasons, I replaced free WiFi with my own personal Internet device. Originally, it AT&T USB modem, then it was Verizon’s MiFi and know it is Verizon’s Intelligent Mobile Hotpsot (like the MiFi but with 4G LTE). With the Hotspot, I have super fast Interent accesss whereever I am (I wrote about it here). No worries about security, whether there is a connection or how fast it is. From the car, the courthouse or the case, the Hotspot allows me to focus on getting my work done rather than on the quality or security of my Internet connection. As alternative to the dedicate device, many smartphones have a hotspot feature that for [quite] a few extra dollars, you can share your phone’s Internet connection with your computer. 4. Digital Documents. Maintaing and dragging around a bunch of paper is the arch enemy of making location irrelevant. If all the documents you need are in file folders in the file cabinet at your office, then you need to within walking distance of the file cabinet. I eliminated this issue by going most paperless for the documents with which I work. This means all correspondence, pleadings, memos, research and the like are maintained as digital files, accesible anywhere. I use Dropbox which is a seamless and simple solution regardless of what device you are on. Dropbox allows me maintain one file system for all digital documents across all my devices. I am always working on the “most recent version” of the document. 5. Browser-centric. The browser is the centerpiece of my work. Browser tabs are often how my tasks are organized. This means that most of my applications are web-based. While technically an application can be “web-based” but independent from a browser, I find an advantage in using applications within the browser. My browser of choice is Google’s Chrome on the Mac (and when it gets buggy I switch over to Safari). Google Chrome for Windows is an equally good if not superior choice. Many of the applications I used in my business and personal life (which are sometimes inextriablcy intertwined) run in a browser tab. For instance, Gmail, Google Reader, Bill4Time, Twitter, Westlaw (for legal research) all run through my browser. The advantage is that regardless of my location, I open the browser and see the same interface and have same experience with the service. This uniformity leads to efficiency. 6. Mobile Power. Nothing short circuits [pun intended] my productive like the laptop, Hotspot or phone dying from a lack of power. To combat this issue, I try to work within range of an outlet or charging source. If its at the libary or a cafe, the source is a wall outlet. If it is in the car, the with a car power adapter. The nice thing about my mobile devices is that they can all be charged through the MacBook Pro: the phone connects and so does the Hotspot with its USB adapter. If there is a plug in for the computer, everything else is good to go. One thought if you are working in your car or on the go: get power connector such as this one that fits into your drink holder and charges a computer, a phone and most other devices. You also avoid some car-cord-clutter with this setup. 7. IP-based phone management tool. To me, no mobile connection beats the quality and consistency of a good landline connection. Even the best cellphone is a bit flaky at times. However, if you are going to work mobile you need to be able to talk and manage call and messages remotely. There are several premium Internet-based phone options, but I use Google Voice. Google Voice is a complement to my landline phone system, it does not replace the phone (Read my review here). It is my go-to service for managing communications, both spoken and textual. Google Voice allows me to have one telephone number that can forward to multiple numbers and the ability to text from the same number. The ability to manage my Google Voice account to a granular level from the web (on a computer or smartphone) is also a plus. No more calling into the office to check messages, the messages are transcribed and on your phone and computer. 8. Head-Phones. This is only a requirement if you will not be working in a noise-insulated, sound and visually distraction-free environment! For rest of us who work in locations with some noise, it is nice to have heahphones to block out the distractions and through music and talk create the environment you need to be productive. I am not picky about what I have been using is the ear buds that come with almost every Apple mobile product. However, there are many higher quality options that will sound better and more effectively eliminate outside noise. I received a great set of Sony Headphones for Christmas.